Janet Cameron has been doing art in many different mediums for many years. She is a self taught artist who attended school for a bit but when they told her it was impossible to do this or that with the different mediums she left. She had been doing those impossible things for years with great success. When we met ten years ago she was producing ‘Thread Art’ pictures and was sewing as fast as she could. She took a hacksaw to the motor housing of her machine because it kept overheating. Still no matter how many she produced she could not keep up. Because it was such a unique craft – sewing a complete picture on canvas using a sewing maching – her work was in demand all over the world and the demand got to be too overwhelming, she got tired and has switched gears. 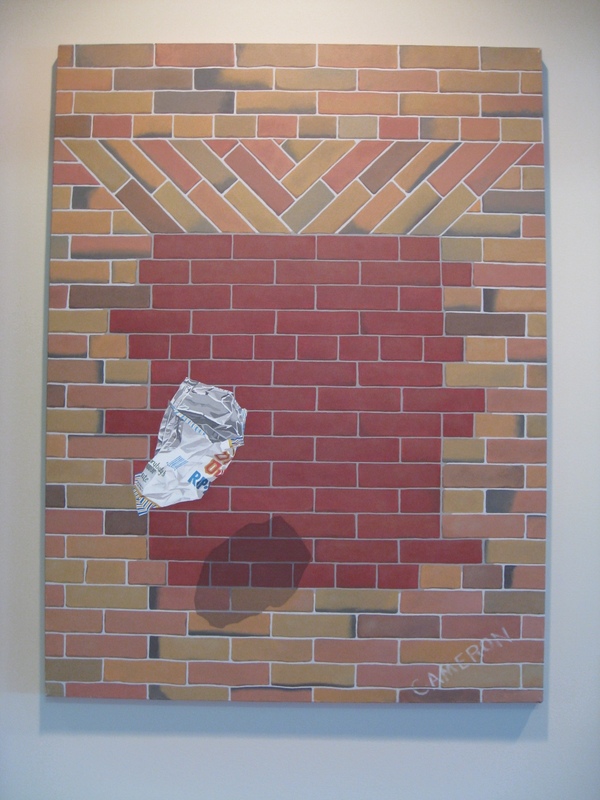 She had been busy with many smaller projects as she has switched mediums. 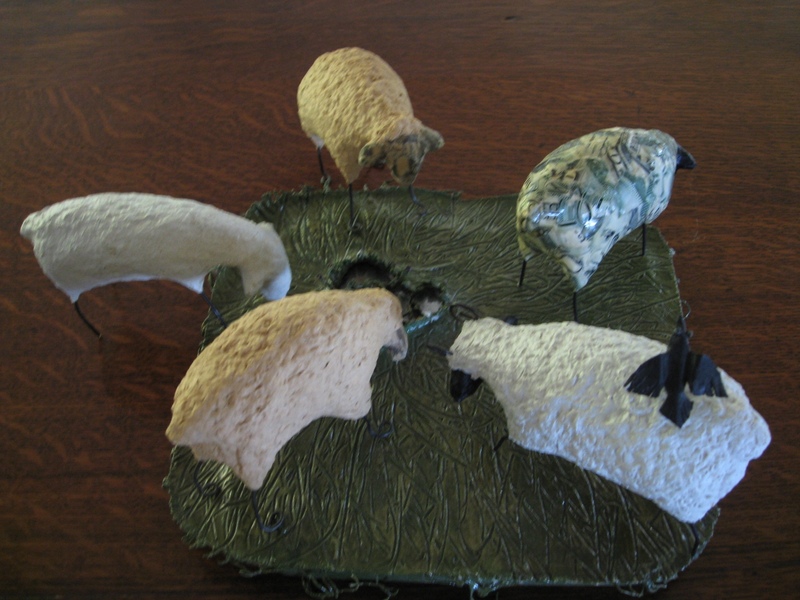 She made geese out of old golf clubs, painted miniature pictures inside old barnacles, painted Santa Claus on toothpicks, painted Santa heads on each flap of a pine cone, made sheep out of papier mache, torn paper pictures, rug hooking, and several thread and acrylic commissions over the years. The list is extensive and varied. She uses these ‘fun projects’ as a break. I would go for coffee and put my feet up but she switches tables and keeps on working! She is challenging herself with a different medium for now. She has moved on to ‘mud and acrylic on canvas’. 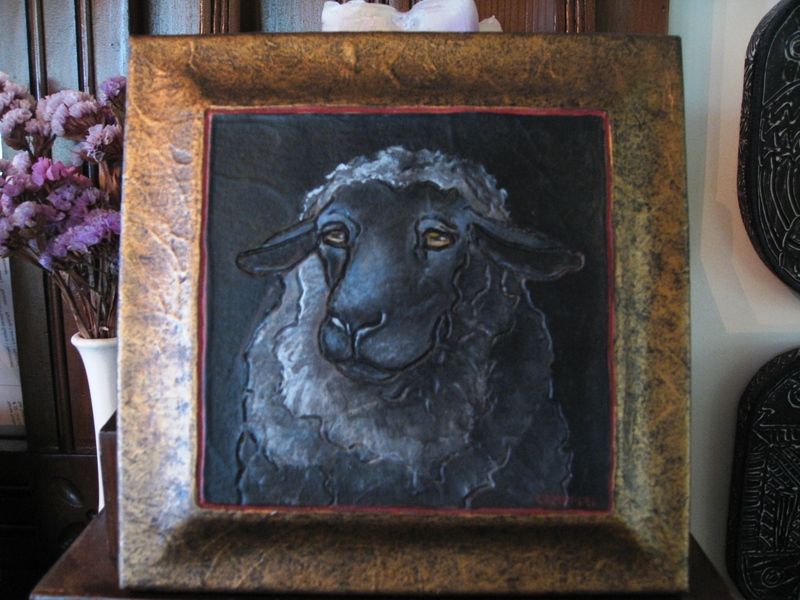 She produced two one foot by one foot canvases of sheep last month. They were outstanding. She sells her work at Judy Mitchell Gallery and I think they sold before she got home from delivering them. Today she took two more of the same size and they sold before she left the parking lot. Her work is stunning and so realistic I would love to have a huge wall to display at least eight one foot by one foot sheep pictures. If she brings them over to show before she takes them to the gallery I will take a picture and put them up for you to enjoy. 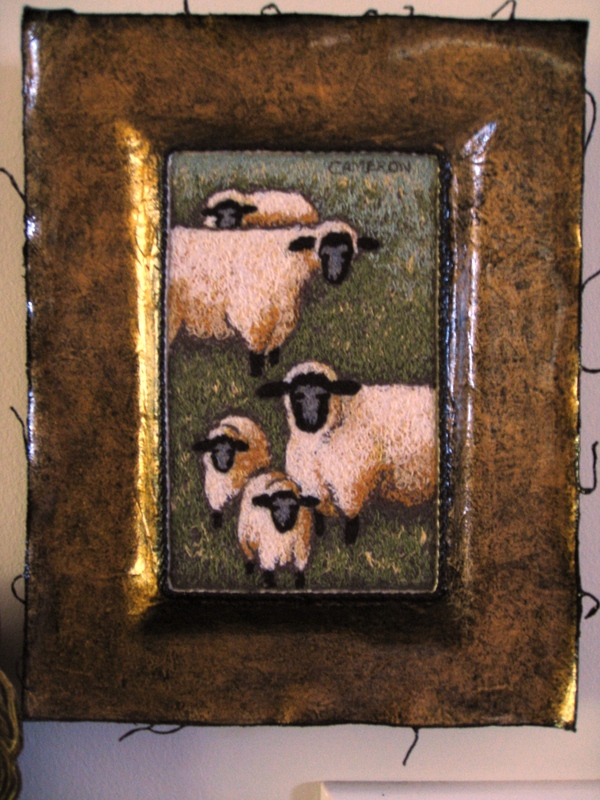 I was privileged to see the first two sheep pictures the same day she took them to the gallery. They were so life like I stood and stared for over ten minutes, I knew they would sell instantly they stared right back and held your gaze! When we asked Janet about art for the cookbook she said yes with great enthusiasm. We had no idea what she would come up with. The cartoon works in “Breakfast with the Broads” are sure to bring a smile. She has a great sense of humour and has applied it to the cartoon story board she has created for her characters. We are privileged to own a variety of Janet’s art work and proud to call her our friend as well. If you come to stay with us and view her works, you will be amazed at her talent. And you may even get to meet her! If Janet stops by and we happen to be serving Salmon Benedict I make sure I have a full jar of capers on hand as she is likely to design some sort of image on top of the Hollandaise Sauce using the capers. The more there are the happier she is as she loves capers!